In Hear This, A.V. Club writers sing the praises of songs they know well. As part of Simpsons Week, we’re picking our favorite songs from the show. When “Homer’s Barbershop Quartet” kicked off season five of The Simpsons in the fall of 1993, the show was well into one of the most consistent winning streaks in television comedy history. The story was deceptively simple: Homer telling his kids the story of his barbershop group, The Be Sharps, and their unlikely rise to fame. Jeff Martin’s script was dense with jokes—the episode tosses off more witty asides and visual gags than most sitcoms can dream of placing front and center. (Moe’s swap-meet hawking of oyster shells painted to look like Lucille Ball always felt especially right.) It uses Homer, Apu, Skinner, and Barney (the Ringo Starr to Chief Wiggum’s Pete Best) as a means of parodying The Beatles, the most famous pop band in history. It works precisely because the jokes are built into a deeply affectionate tribute to the Fab Four, mocking the nature of fame more than the group itself. 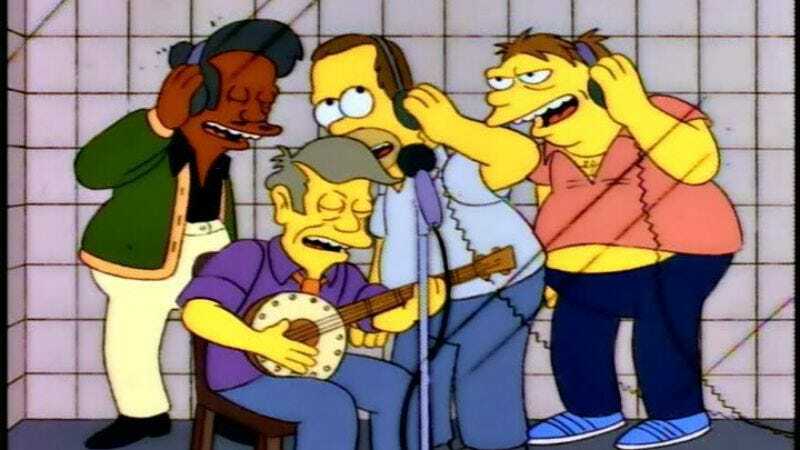 But none of it would work without a compelling song to justify the Springfield quartet’s launch into superstardom. The show could’ve layered on all the “rags to riches” montages it wanted, but without a catchy tune that could credibly become a novelty hit, it would have rung hollow. “Baby On Board” (co-written by real-life Disney barbershop quartet The Dapper Dans) nails it: the ukulele accompaniment, the jaunty melody, the outré style… it works because it seems so plausible. Of course the America of The Simpsons universe experienced a brief flurry of barbershop fever in the mid-’80s—it seems like something that should’ve happened in real life. The fusing of a Tiny Tim-like novelty act with the iconography of The Beatles is the very definition of what could make a one-hit wonder. The song is like “Macarena,” or “Don’t Worry Be Happy,” or any number of other oddities that went to number one through sheer coincidence of timing and overpowering earworm hook. Just like the most memorable one-hit wonders, the parody blurs into sincerity. To this day, Skinner’s opening “Ba-bum, bum, bum” triggers an involuntary toe tap—no wonder Springfield (and, eventually, the world) fell for it.